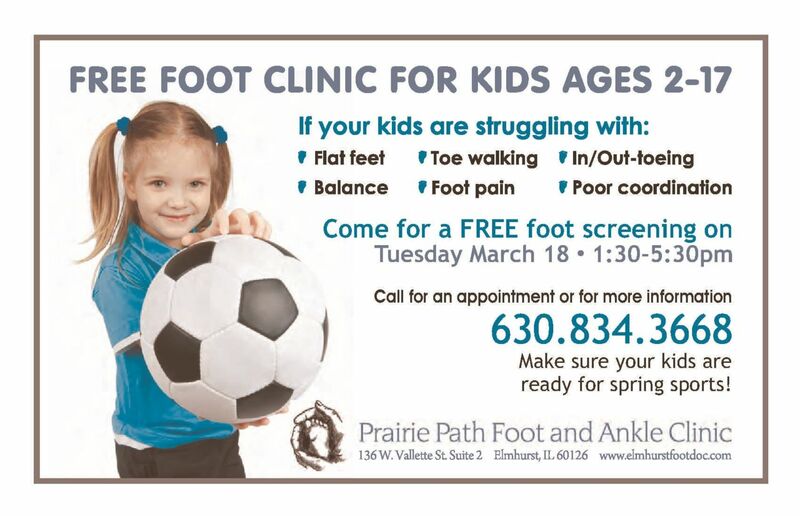 Prairie Path Foot and Ankle Clinic is hosting a free clinic for kids ages 2-17 on Tuesday March 18th from 1:30-5:50. No appointment necessary and you do not need to be a current patient! Our doctors will be on hand to evaluate your child for any conditions that you feel need checking. There is no need to make an appointment unless there is a certain time you need to be seen at due to scheduling conflicts. Our clinic will be first come first served. Feel free to contact our office at 630-834-3668 if you have any questions.